Trader Joe’s happens to be my family’s favorite store. We don’t have one near our house so every time we go near one we stock up on all of our favorite products. This time we also tried a couple of new products! Here’s the list of what we bought this weekend while visiting our friends in Ohio. 1. Fuji Apple Slices– These were the perfect snack for our drive back home. They tasted just like Fuji apples! I am so happy with the quality and taste of these apple slices so we will definitely buy them again. 2. Multigrain Bread– My family loves bread so we are always on the lookout for a new kind. I haven’t tried this yet but I can tell that it is really good quality bread! 3. Mocha Cappuccino Mix– My mom is taking this to work so I’m not sure I will get to try it. But it smells really good and comes in a cute little can! 4. Organic Ginger Pear White Tea– Yummy! I had a mug of this stuff last night before bed and it is absolutely delicious! I am so happy that I decided to add this to my tea collection! It’s a light, fruity tea. I was afraid that the pear flavor would be overpowering but it isn’t at all. It’s the perfect combination of ginger, pear, and white tea. If you love trying new flavors of tea then I definitely recommend this! It is so yummy! 5. Coconut Cranberry Granola– We bought two boxes of these because they are simply the best granola ever. And for $2.49 a box you really can’t beat the price! This is great with yogurt (Coconut Greek is my favorite) or just with milk. So yummy and inexpensive! 6. Speculoos Cookie Butter– Once again, we bought two jars of this because it is the best thing in the world. I love cookie butter!!! It is my favorite sweet treat and goes good with apples, celery, or just by itself. The possibilities are endless and you can really put this on anything. I love it. 7. Speculoos Cookie & Cocoa Swirl- This goes great on apples. In my opinion, it’s not as good as the original cookie butter but still tastes amazing! This is a repurchase for us and will continue to be on my list of Trader Joe’s must haves. 8. Lavender Salt Scrub– My sister got this last time and I was so jealous so I went ahead and bought myself a jar. And let me tell you, it is heavenly. I am a huge fan of Lavender and this does not disappoint! It is the perfect body scrub and smells so delicious! 9. Coconut Oil Body Butter– This is the first time that we have purchased body butter from Trader Joe’s. I am not at all disappointed with it because it isn’t oily or too heavy. It is just the right amount of moisture and leaves my body feeling soft and lovely. 10. Tea Tree Oil– My sister and I have wanted to try Tea Tree oil for a long time. We finally decided to buy some and I am so happy that we did! It smells terrible but I have only used it a couple of times and can already see results! I am using it on pimples, acne scars, and other issues on my face. It really reduces the redness and the swelling on my face! I am really pleased with it so far and will continue to find new uses for tea tree oil. A little bit goes a long way so I’m sure this bottle will last us a long time. If you have any tips or uses for tea tree oil please let me know! 11. Coffee A Cocoa– I am not a coffee fan but this is my mom and sister’s favorite kind. So I assume it’s really good because they buy it every time we are at TJ’s! 12. Dark Chocolate Peanut Buttercups– These were an impulse buy but are so delicious! We were originally looking for Justin’s Organic Peanut Buttercups but we couldn’t find them. So we got these and they are amazing! We have them in our refrigerator and I have to stop myself from eating the whole container! So yummy! So that’s all we got this time! 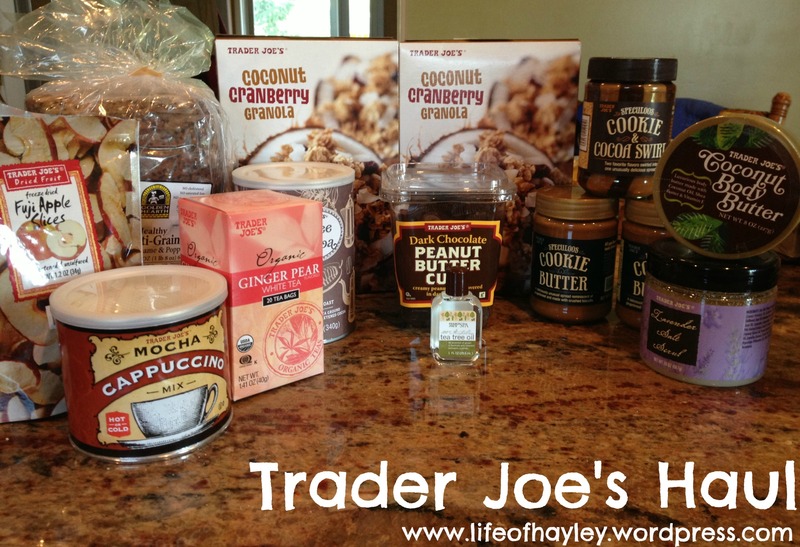 Please let me know if you have a favorite Trader Joe’s item that I have to try! I will post more about our mini trip to Ohio soon!